The Toast is singular among the ladyblogs. It is primarily a humor site with a heavy focus on the literary, pop culture and general nerdy content targeting young women. It doesn’t trade in celebrity gossip, and its editors, Nicole Cliffe and Mallory Ortberg, do not work for a man. It does not have outside backers. Cliffe and Ortberg are ladyblog veterans. The former was the books editor at The Hairpin whereas the latter was a frequent contributor. As the site has matured, Ortberg and Cliffe have focused on introducing new, non-New York voices to a wider audience. “There are other states in America and writers live in all of them,” as Ortberg put it. Ortberg and Cliffe split ownership equally with the publisher, Nick Pavich, who prefers to remain behind the scenes. “I want to be the only white male in history who’s not offering an opinion about [the HBO show] Girls,” he said. Pavich last year began using vertical ad networks including LitBreaker, BookRiot and Blogads, and employed native advertising. He also brought in digital library Jstor, Warby Parker and several iPhone apps. More than 50 percent of the site’s revenue comes from display ads. 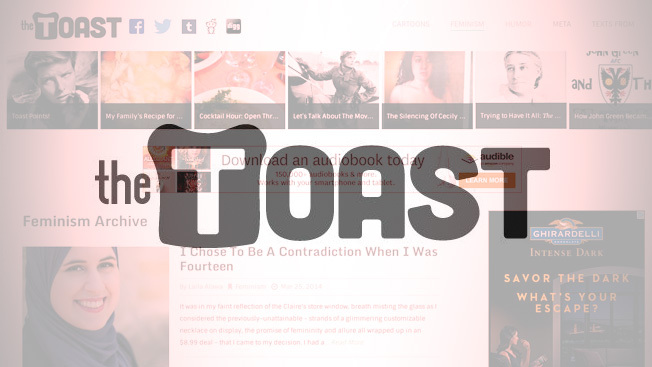 The Toast gets about 2 million clicks per month and a consistent monthly bump of about 150,000, per Quantcast. Traffic-wise, it lags a number of competitors, including Bustle and xoJane. But according to Pavich, the site performs well in metrics such as pages per visit (2.9), time spent on the site (3:14) and unique visitors (16,367). The site’s unique positioning may be its key to long-term success. “They have a better chance of success as a niche blog than if they were all things to all women—otherwise, there would be a lot of competition,” says Jim Lin, vp at Ketchum Digital. Pavich says the next step is the launch of sister sites in the vein of The Awl network. The first of those likely will be a still-unnamed mommy blog. “We’ll have to grow up as a corporation,” he said.